The front. My students were so entranced watching my hand sew these little things. The back of the sewing kit. There is a place for everything! I absolutely love how it turned out! There are three different pockets. A place for thread and embroidery floss. A special home for my scissors! And an area for my needles, pens, and a hoop. I'm super thrilled and can't wait to use it! 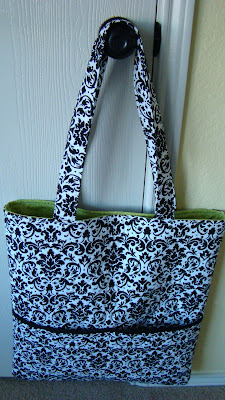 I have been on a tote making spree lately. I had my first commissioned project, which was super exciting. I was asked to make two totes for a bride and her maid of honor. The mother picked out the fabric and gave a brief description of what she wanted and I went to town! 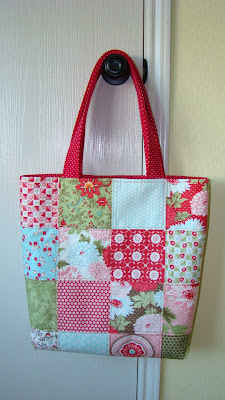 I made two, very large totes for her and she loved them!!! The fabrics match the brides wedding colors and I was able to quilt the fabric for a Vera Bradley type of look! It's awesome to see something that you have made bring joy to another person! And since I was making totes, I figured I might as well make one for myself, right? So I found a charm pack lying around and out popped this simple, but cute, tote! I think I might be addicted to swaps! I joined two more in the past two weeks, the Sewn Spaces Swap and the Pretty little Pouch Swap. Pincushions are the theme for the Sewn Spaces Swap this round, and I have been checking out my partners info. I made a pincushion that isn't necessarily what I would make for myself, but I think she will love it! I am still doing a little research for my partner for the Pretty little Pouch Swap. I think I know what pattern I am planning on using but fabric choices aren't made yet. I am planning on going to my LQS this weekend and hopefully I will be starting her pouch sometime next week! September, where have you gone? It has been forever since my last post. The beginning of the school year is always crazy but this year has been even more nuts than normal. My husband, who is also a teacher, started coaching football this year. Let me modify that last statement ..... my husband is coaching Texas football this year. To some here in the great state of Texas, football is a religion. So needless to say, my wonderful hubby hasn't been home as much as he used to be. So, trying to be a good wife, I am now taking care of everything around the house, while maintaining my full-time job. I don't know how you ladies with little ones do it! It's hard enough just managing everything for us two, I can't imagine having a child to take care of too! So all you moms out there .... I give you props! Well, in my absence, there is sooo much to catch you all up on! And I received this amazing pouch from Diane, from from blank pages. 2. I entered my second swap, For the Love of Solids. This was an amazing swap as well! I made a pillow cover and mug rug for my partner. I had to cover my partner's name to keep it a surprise. It totally slipped my mind to take a pic without her name covered. Ooops! And I received the most fantastic sewing machine cover from Nicole! And yes it is reversible! !